Wendy is a well known West Australian artist, author and potter and has a studio in South Fremantle. She operates under the name, "Stunned Emu Designs." Pottery - Wendy produces fully funtional hand made terracotta pottery. 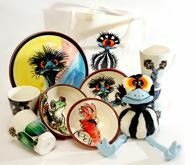 She handpaints each piece with brightly coloured, beautiful and quirky Australian animals. Wendy is best known for her "Emu with Attitude"! 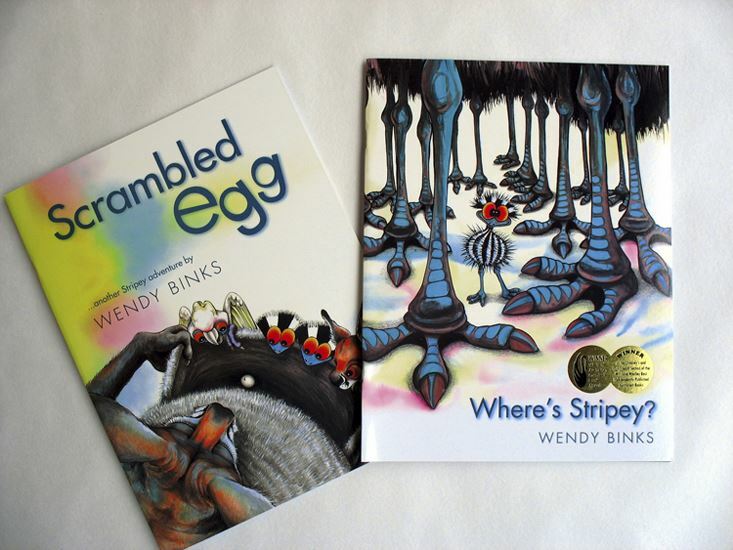 Children's books - Wendy has written, illustrated and self published the children's books "Where's Stripey? ",which has won 2 major awards, and "Scrambled Egg". Due to the popularity of the "Stripey" books, Wendy has now created a 32 page Stripey Activity book full of fun and educational activities including dot to dots, crosswords, quizzes, colouring in etc. The activity book is a blackline master so is suitable for teachers and parents alike. Wendy is available for author visits at schools and libraries, please contact her for more information. The third book in the Stripey series is due out in 2010. Due to popular requests the launch will coincide with Wendy's first painting exhibition in four years. The artwork will be mainly landscape paintings, including her popular Rottnest scenes, and introducing art inspired by her recent bushwalking adventures in The Northern Terrority and Australian Alps. Date to be confirmed. 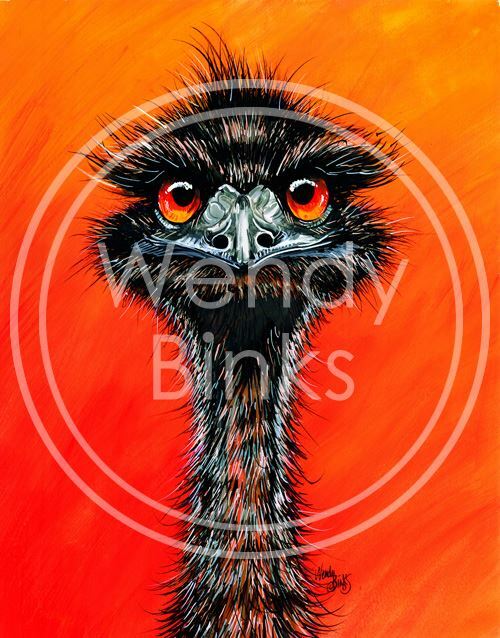 Artwork - Wendy has a wide range of original acrylic paintings available at the stall, featuring her trademark Australian animals and emus. Also available are canvas prints, which can be rolled in a tube and shipped anywhere within Australia or overseas. For a full range of prints please visit her website www.wendybinks.com.au. Gift Items - All of Wendy's most popular designs are available as stationery and gift items, ranging from magnets, bags, cards, mounted prints, patches, mugs, postcards, and of course the lovable Stripey plush toy. For a short time only Stripey Showbags are available containing goods worth $47.50 but selling for only $22 (while stock lasts). Wholesale orders are welcome. Please contact her for catalogue and price list. 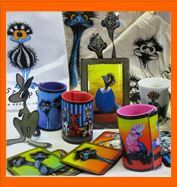 Pottery, cards, magnets, metal art, stripey toy, emu bags, children's books, activity books, gift items, canvas prints, emu patches, postcards and original paintings. Wendy Binks and Stripey are now on facebook. Visit them at Stunned Emu Designs to 'like' and 'share' news, new products and events. Also visit www.wendybinks.com for free activity downloads for the kids, and on the home page see a video of actor Shane Jacobson reading 'Where's Stripey?"